For years now I have been reading lots and lots of blogs. Over this time I have found some blogs that really stick out for me and that I find myself checking daily to see if they have uploaded a new post. 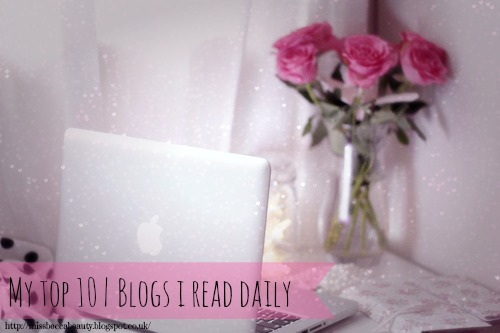 I thought I would share with you my top 10 blogs that I read daily. I just want to say that this list is in no particular order! Now Louise is one of my inspirations. She is always so happy, bubbly and friendly. I have read her blog and watched her videos for about 2 years now and I am so glad that I found her. What I love most are her advise blogs because I feel that she inspires a lot of people so it is good when she discusses difficult topics that otherwise people might not know a lot about. Also I rally admire how body confident she and I hope that one day I can be as confident in my own body as she is. I have only recently discovered Sarah's blog, and what originally drew me to it was the simple yet stylish blog design. My favourite posts of hers that I like to read are her '10 Things' posts. This is where I got the inspiration for this post. I found this blog when I looked up how to do a sixties beehive and I haven't turned back since. I mainly love their photography and fashion posts as I find that they both have wonderful and unique styles. I also find their photography posts really helpful. Oliva has really good photography skills and I love her OOTD posts. She is always really creative with the layout of her photographs and I am so excited that she has recently started a YouTube channel. What can I say, this gal is amazing. I have subscribed to her YouTube as well and she never disappoints. I really like her lifestyle posts as I am really nosy and like to see what everyone is getting up to! Also I love her photography, she is another one of my photography icons. If you haven't noticed I am really into photography and I am always trying to improve my photography. I discovered Nic and Sam's channel on YouTube when I was looking up makeup tutorials and I find their tutorials so helpful. The only problem is you can't just watch one video you have to click on all the suggestions and before I know it I have spent 2 hours watching their videos, whoops!! Then I started reading their blog and it is really good as well. Again I discovered Tanya through YouTube and her blog is incredible. She has so much knowledge on beauty and all her reviews are really helpful. Her lifestyle blogs are m favourite and her and Jim and so cute together! I only discovered this blog a couple of days ago, but I feel like I have been reading it for years as the other day I spent hours reading all her previous posts! At the moment I am loving a little series she is doing called 'The Best Drugstore Makeup Ever' I would recommend having a look at that as it is really helpful. Also I love all the headers she does at the start of each post, they are very cool! In my opinion, Fleur's beauty reviews are the best out there. She always has something new and interesting to say and her advise is always right. 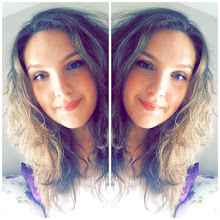 She also has a few channels of YouTube which cover different aspects of her life. This girl is so good at what she does. She recently started a YouTube channel and by-gum she her videos are good. I would say that in a few years time she will be as big as someone like SprinkleofGlitter or Zoella. Her blog design is so cute and girly and all her posts are spot-on. These are my top 10 blogs that I read on a daily base. I would be really interested to find out what blogs you read and love. Also I would recommended having a look at all these blogs I have mentioned!